It’s summertime, and thoughts of summer bring to mind pictures of people lounging in the sun, reading. I read all the time for many reasons, but sometimes I like to give myself the gift of reading guilt-free, just for fun. After all, reading has always been my most enjoyable non-writing activity. In high school, I discovered classic novels, including Russian titles such as Anna Karenina, War and Peace, Crime and Punishment, The Brothers Karamazov (didn’t ever get through that last one). When my children were young, I couldn’t find as much time to read, settling for short books on how to keep your sanity while parenting young children. And children’s books, of course. My current interests vary widely. I have always loved historical fiction, and I should, since that’s primarily what I write, but I also enjoy good contemporary fiction. I’m on the library committee at our church, so I get to read lots of different Christian authors: Jeanette Windle, Joel C. Rosenberg, Heather Day Gilbert, Patrick W. Carr, Terri Blackstock, James Scott Bell, Angela Hunt, Jill Eileen Smith, Dani Pettrey, Dee Henderson, Siri Mitchell, to mention a few. My preferred secular books are Alexander McCall Smith’s The Ladies No. 1 Detective Agency series, Alan Bradley’s Flavia deLuce series, and Kate Morton’s novels. I also stumbled upon Lorena McCourtney’s Ivy Malone cozy mysteries, which I love. Add to that my complete series of The Cat Who books by Lilian Jackson Braun, which I’ve read and re-read for easy, engaging entertainment. I could go on, but I’d love to know what some of your favorite titles are. What do you read just for fun? Before we begin talking about plot outlines, character development and setting, let’s discuss a little concept called genre. The word is pronounced john-ra or zhon-ra, and it simply means kind or variety. In our case, it refers to the kinds of stories we read and write. 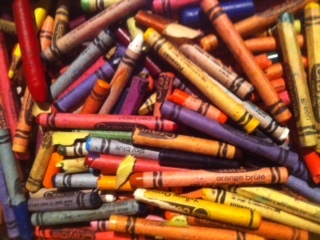 There are as many kinds of stories out there as there are crayons in a box. Some of the basic genres are: Mystery (Anne Perry’s William Monk or Thomas and Charlotte Pitt series), Thriller/Suspense (books by Brandilyn Collins), Horror (Ted Dekker), Sci-Fi (DragonKeeper Chronicles by Donita K. Paul) , Fantasy (J.R.R. Tolkien’s Lord of the Rings), Western (Louis L’Amour), Romance (Karen Kingsbury), Historical Fiction (Bodie Thoene’s Zion Covenant and Zion Chronicles), Children’s (classics like A Wrinkle in Time by Madeleine L’Engle), Young Adult (excellent theme books by Melody Carlson), and Short Fiction. Each of these genres can be broken up into sub-genres, of which new ones are being developed every day. For example, some of the sub-genres in the Mystery theme are: Amateur Investigator, Bumbling Detective, Cozy, Legal, Police Procedural, Whodunit, etc. See the following link for more information: http://www.cuebon.com/ewriters/genres.html. What’s your genre? The key question to help you discover this is usually: what kinds of stories do you most like to read? I say usually, because I love reading and listening to mysteries, but I haven’t figured out how to write a good one…yet. I also love reading historical fiction, and the more I read, the more I learn about how it’s done. Based on your favourite genres of fiction, which would you most like to write? Why? I like Historical Fiction because it reminds me that every historical figure that inspires me to write about them has actually lived and died, loved and hated, succeeded and failed. Each is real and unique and deserves to be known and understood, at least to some degree. When I create characters in historical fiction, it is with the hope that they will become as real as if they had actually lived. Although most of us know what kind of story we want to write, the conundrum that presents itself is whether to write what’s on our hearts or what will sell best. The answer depends on our goals. If our number one objective is to sell our story, then we must research and write what’s selling. My agent once suggested that anything with a buggy and bonnet on the cover would sell. (I can’t tell you why, after all this time, but that’s another issue.) We can still be creative when we write for the market, but we must make sure we’re okay with it. Personally, I need to write from the heart, whether it sells immediately or not. Pair that with the premise of Kevin Costner’s movie, Field of Dreams: “Build it and he will come.” Write it, and the readers will come, so we hope and pray. The choice is up to us as individuals. For the Christian writer, published or not, the choice of genre is important. If we plan to build a platform (the genre and style of writing that people think of when they recognize our names, also referred to as our brand), we will need to concentrate on writing in one genre until we are known by our readers.